India I have heard Bob say quite a few times that “little girls are dangerous,” and this brag is about one such little girl. 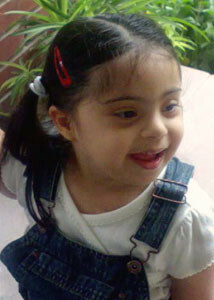 Aishanie Saigal is a three year old ball of energy who has a lot to say about her world. She was diagnosed with Down syndrome at birth, and she has had a few surgeries to correct her heart condition. She started an NACD program in 2007, and I became acquainted with her in January 2009. At that time she waddled about and had not even started putting two words together. She soon started coming to the NACD center in India where we have provision to implement the program, and I got to know her better.When I look at her today it seems like we have come a long way. To work with her is a battle of wits. Being in “lock and block three” stage (i.e. referring to her sequential processing level and associated behavior), she invents novel ways to avoid work. She charms you, she involves you in discussions that cannot wait, and she’ll dance for you. However, when it is about impressing someone, she is all at it. She is a great entertainer. Aishanie now talks in 3- 4 word phrases and sometimes strings two phrases together. She loves talking about her little sister and she loves playing with puppets. She has a huge stack of word cards that she can confidently read. Her confidence goes unparalleled. Aishanie just started preschool. During the admission procedure she left a mark on everyone she met. She sat down with the principal, the school’s owner, and her special educator and she counted, identified her colors, alphabets, numbers and several stacks of picture cards. She left everyone in awe of her. I walked out proud from the school when the principal said to me that “she knew more than any three year old in that school.” During the last eval I sat down with her mother and we looked back at when we had just started and congratulated each other. We both share this feeling of pride. However, we both agree that this is just the start for our dear little Aishanie. It is worth a mention that this little girl was the first “child with disability” attending that school and since then the school has added two more children with labels. Keep soaring higher, little girl!